Sometime last month, I painted my first horse in watercolor pencil, and decided I wanted to explore them further. Since then, I’ve found a few books that failed to inspire or help. 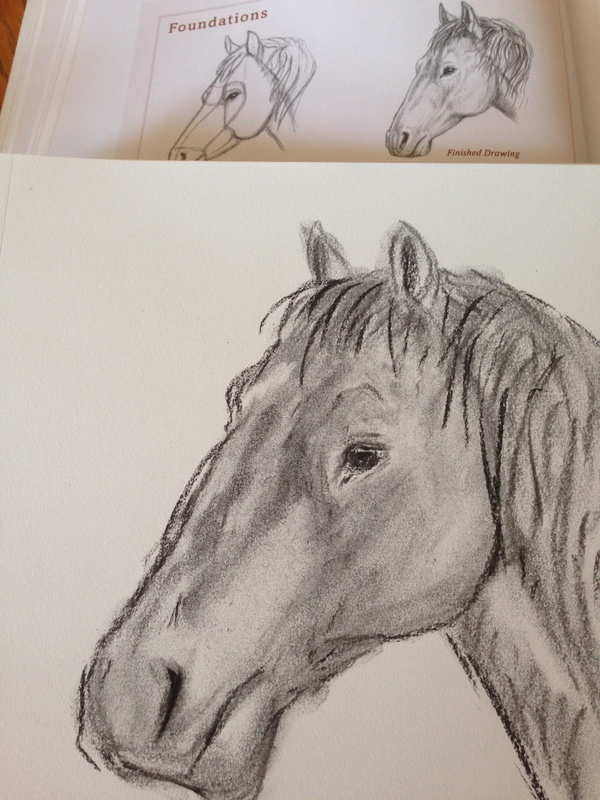 Until now….I have two books to recommend to anyone interested in drawing animals, and horses in particular. I first learned about author J. C. Amberlyn from this wonderful post from Joan at Dusty Acres Studio, which inspired the heck outta me and made me wanna go grab a book by Amberlyn immediately. Our library system owned this one: “The Artist’s Guide to Drawing Animals” and I was able to recently acquire it. I’ve not read the book, only skimmed it, but since I really want to learn to draw (and paint) wildlife accurately, this book looks to fill the bill perfectly. She breaks animals down into basic shapes, she explains skeletal structures, focuses on the eye, the nose, mouth, etc., of each, and I find her artwork inspirational and her teaching accessible to this beginner. I may wind up buying this book, as she covers so many animals I’d like to become more familiar with, and it would make an excellent reference book in years to come. A little better, but still a ways to go. I think the head still needs to come down even longer. Did I sketch in the three circles first, block out the head, as Amberlyn recommends? Um, nope, just went right in with the charcoal as I’m prone to do (act first, think later), but….at least now I have a book that I feel can really help me to progress. I also want to mention the other book I found, called “Drawing Horses: Basic Drawing and Painting Techniques” by David Sanmiguel. This book was published earlier this month, and looks to be another great reference. 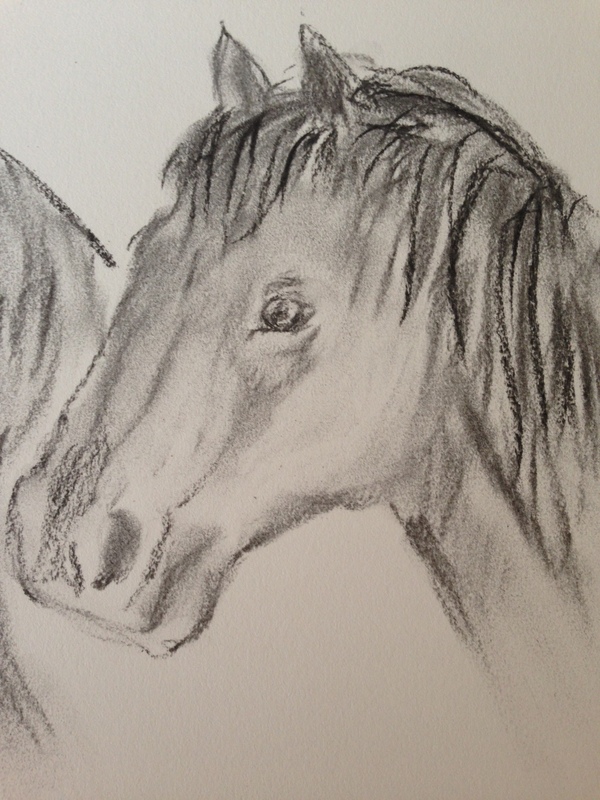 It’s devoted to capturing the horse in almost any medium: graphite, charcoal, pastel, ink, watercolor, and more. As I said, both books look like winners, but if you’re interested in drawing animals of all kinds, you don’t want to miss Amberlyn’s book. Good information and great drawing! I really like your drawings. 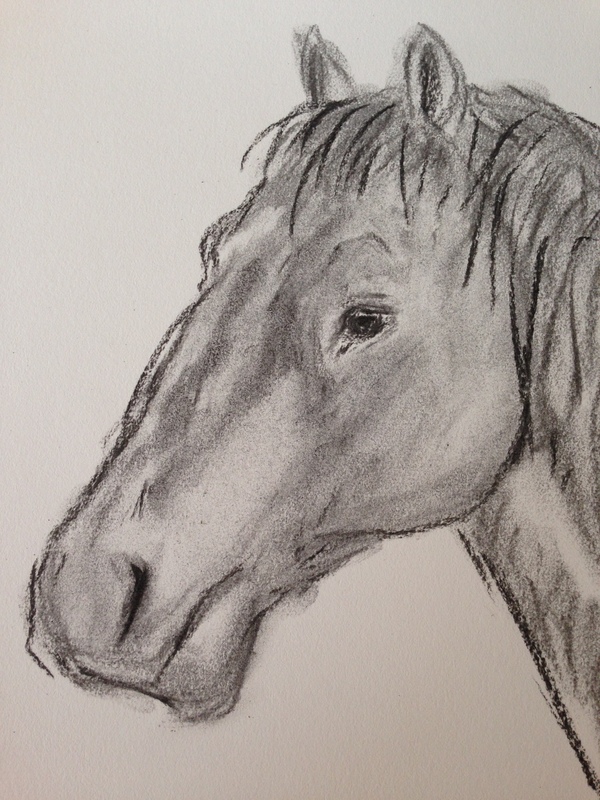 Though I see the difference and understand your desire to improve your ability to draw horses….I think what you have drawn is wonderful! Thank you very much!! I really appreciate it. I’d love to paint them and capture their proportions more accurately. They’re so soulful and beautiful. I’ll keep working on them. I really appreciate your comment and that you like them as they are. Thanks for visiting and commenting! This is great Laura. Lovely. You are so generous all around…with the information you share and sharing your journey. Thank you. Thanks, Evelyn! Charcoal is fun! Thanks! That’s what Hub said about the first one. I was trying to draw that same sketch from the last photo tho lol. I’m glad you like it. Charcoal is much easier than trying to use pencil or ink. You can fix mistakes much more easily. OK, THIS is like the 3rd time I’ve tried to reply – hit & miss internet reception where I’m at – i don’t like charcoal much – so messy. What do you like using? I was watching a video that mentioned willow charcoal so I ordered some the next time I placed a Blick order. (I always order enough to get free shipping, it’s my downfall lol). I was staying away due the mess too, and I can’t say there was no mess, but it pretty much stayed on my fingers and rinsed off faster than the mixed media stuff I work with, so I’ll definitely give it another try. The Frugal Crafter uses cheap hair spray for a fixative, which I’d never tried, but it worked great on my picture, which was in my sketchbook and would’ve likely smudged without a coating of something. I’m chemically sensitive, so I asked Hub to spray it outside and it worked great! I figure it has to smell less than the “art fixatives”, although I don’t know as I’ve never tried them. I just know masking fluid smells so bad that after ordering it and taking a sniff, I’ve never used it since lol! PS I hope you’re having a great time at the lake or wherever you are, Jill! Awesome progress!!! I’ve been busy traveling and partying! Ready for some down art time. Glad to see you at if. Just lovely!! My library has an excellent drawing animals book, too, but I can’t remember what the title is…have been meaning to go back and reborrow it. I have one or two myself, but I liked the library one better. Am pulling up your link to see if it’s the same book. I like your practice horses! I’ll be curious what the title is when you find it, Teresa! My bad internet wouldn’t let me pull up your link last night so I will have to check today to see if it’s that book I was thinking of. I’ll let you know! I finally resorted to my phone (thank goodness for smart phones)…LOL! The book I really enjoyed was by the same author, but it’s called “Complete Guide to Drawing Animals.” I like the one you recommended from the cover and will check that out, too. Thanks! Nice horses, glad you like the Amberlyn books. I have two and love them both. I haven’t tried working in charcoal yet. I’m going to have to give it a go. I’m glad you like them, Joan, and thanks for the follow, by the way. Ugh, didn’t mean to click Send so soon. I’d love to see you work in charcoal. I thought it would be much messier than it was. Also tried using hair spray for fixative, and it worked surprisingly well. Apparently the key is to buy the really cheap kind without any conditioners. I used Final Net. Joan, I’m not sure if I’ve asked you before, but did you paint the bunny in your avatar? It is really lovely. I get inspired every time I see it! Is it watercolor? Yes, I painted the bunny in my avatar. I met him on a camping trip. He is done in water colour and ink. Maybe a bit of pencil crayon, I don’t remember. It’s in a different sketch book than I’m using now. wow….well there you go! Nice work learning and sketching! Thanks, Rebecca! I shall plod on! The horse is really tough. I may try some other animals as palate cleansers in between. This looks good. You’ve been busy! Thanks! So many subjects, so little time! Thanks, Blue, and thanks for that link also! Thanks for the follow and visit, as well! I’ll check out that article. I’m an Artist Network fan, for sure.